"Ma," asked Hosh, "Can we flavor up traditional Chhaach too?" "Why not?" answered Isha, "Like most milk products, Chhaas or Matthaa is healthy, versatile, nutritious, and delicious anyway." "You can serve it plain or flavoured to almost anyone, anywhere, anytime. All buttermilk variants are cheap, fast and easy to prepare." "It is quite helpful to sufferers of lactose intolerance, whose digestive systems lack the enzymes to break down lactose to simpler sugars." "And it has lesser calories and lower fat than whole milk or curd. One cup of whole milk contains 157 calories and 8.9 grams of fat whereas one cup of buttermilk contains 99 calories and 2.2 grams of fat." "Not only is it soothing to stomach and skin, it contains vitamins, potassium, calcium, and traces of phosphorus that are vital for our body." "Chaas is drunk with the main meal in many states of North India, as it is considered to be an excellent coolant in summer. It is also a staple drink in South India, where it is called Majjige in Kannada, Taak in Marathi, Majjiga in Telugu, Moru in Tamil and Malayalam, Mahi in Nepali, and Ghol in Bengali languages." "Ghol?" Hosh asked, "Doesn't that word mean 'solution' in Hindi?" "Yea," she agreed, "Apt, isn't it? Whisked with three to five times its volume with water and with a pinch of salt and other spices, Dahi produces Ghol, a very soothing drink. 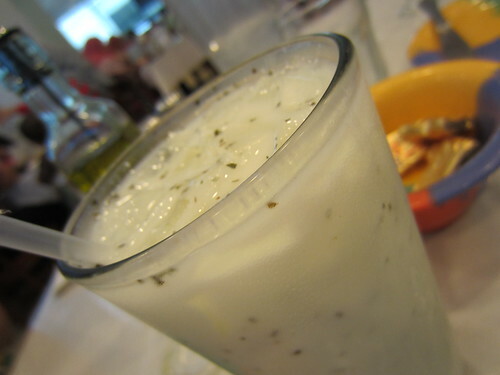 It is similar to Turkish ayran, Armenian tahn (tan) and Persian doogh." "Doogh," she replied, "is a savory yoghurt drink popular in Iran, Afghanistan, Armenia, Iraq, and Syria. It is sometimes carbonated and seasoned with dried mint or pennyroyal. Some varieties of doogh lack carbonation. Others include diced cucumbers to provide a crunchy texture to the beverage." "Ayran is a cold salted yoghourt beverage popular in Turkey, Afghanistan, Azerbaijan, the Balkans, Kazakhstan, Kyrgyzstan, Lebanon, Syria and across the Caucasus. Like Mattha, Ayran is served chilled and often as an accompaniment to grilled meat or rice, especially in the summer months." "Ma," Hosh asked, "you showed me how to get buttermilk from Dahee earlier. If you churn Dahi, can you get butter too, along with buttermilk?" "Absolutely," she answered, "Buttermilk was so called because it was the liquid by-product of the butter manufacturing process, regardless of which process is used in making butter." "However," she continued, "When Dahi, which is a whole-milk yogurt with live-culture, is churned by hand as was done traditionally, the butter yield is much less as the fat globules are scattered in the liquid. So it has a higher fat content." "Can we make a flavored Chhaas from Dahi now, Ma," Hosh interrupted, "to see how different its higher fat content tastes from plain traditional Chhaach?" "Blend all the ingredients," she said, when he had assembled them all, "in a food processor or blender. Use only some curd and water to start with, because you don't want to blend Dahi too much." "When the greens look well blended, add the rest of Dahi and water and blend for a few more seconds to get uniform consistency in your drink." "You'll get traditional Chhaach if you just use Dahi and water and no spices. But with one or more of the optional ingredients used, you'll get closer to creating a Masala Matthaa you enjoy." "Try out combinations of the optional spices, and you'll find one that you love best. Garnish with coriander or mint leaves and serve chilled."